A Electric drill is a tool fitted with a cutting tool attachment or driving tool attachment, usually a drill bit or driver bit, used for drilling holes in various materials or fastening various materials together with the use of fasteners. The attachment is gripped by a chuck at one end of the drill and rotated while pressed against the target material. The tip, and sometimes edges, of the cutting tool does the work of cutting into the target material. This may be slicing off thin shavings (twist drill or auger bits), grinding off small particles (oil drilling), crushing and removing pieces of the workpiece (SDS masonry drill), countersinking, counterboring, or other operations. When you have to drill a nail here and there at home, why spend money on a carpenter? Do it yourself with this easy-to-use YI King Electric Drill. 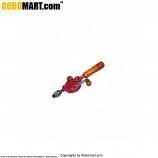 It comes with all the necessary pieces required for drilling like the bits, screwdriver set, brush, chuck key and also an instruction manual to guide you step-by-step. The insulated shock-proof body of this machine makes it absolutely safe to use. 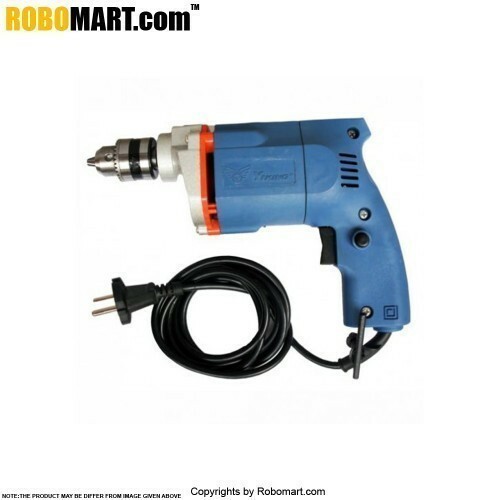 Save time and make your house look perfect with this 10 mm drill machine. 1.This drill machine has an ergonomic design with optimal grip position. 2.It is decent in weight and can be used for multiple tasks. 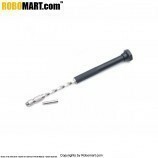 3.The drill machine has an Insulated shock proof plastic body which makes it safe to use. 4.The drill machine has a powerful motor and high impact rate for fast, effortless masonry drilling. 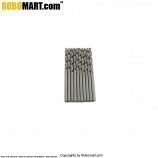 5.The combination tool kit comes with bits of various sizes which are easy to change. 6.The superior quality of 3 way ratchet screwdriver that accompanies the set enables you to fasten or loosen door knobs and more. 7.It is an effective and decently weighted, corded drill machine which can be used for routine home improvement activities without having to call the carpenter every time for minute processes like drilling a hole in a wall or fixing the furniture. 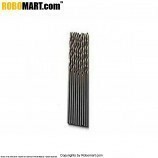 8.The product is useful for drilling small holes into wood, metal, brick walls to fix paintings, shelves. 9.The machine utilises and consumes less power due to strong construction of armature windings and helps you save on electricity. 10.This product makes you self sufficient to take care of your daily chores or odd jobs without having to call a service provider or a mechanic - enabling you to save on money and cut cost simultaneously. 11.Put up your precious paintings, set right your furniture or simply work around your home. 12.Fix an extra shelf in the kitchen or a curtain Rod in the living room, repair a broken chair or hang a chandelier on the ceiling with help of 10mm drill machine.